Macroeconomic time series such as total unemployment or total industrial production concern data which are aggregated across regions, sectors, or age categories. 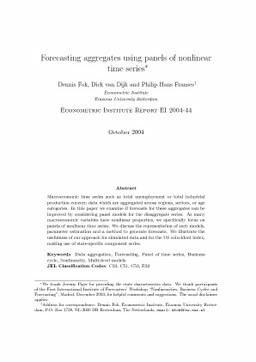 In this paper we examine if forecasts for these aggregates can be improved by considering panel models for the disaggregate series. As many macroeconomic variables have nonlinear properties, we specifically focus on panels of nonlinear time series. We discuss the representation of such models, parameter estimation and a method to generate forecasts. We illustrate the usefulness of our approach for simulated data and for the US coincident index, making use of state-specific component series.